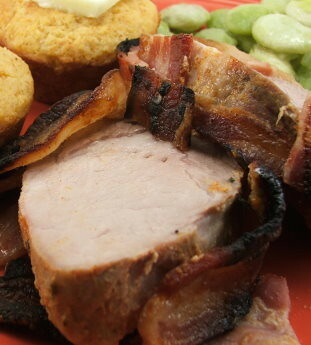 I love pork products, and I love finding new ways to cook with this most versatile ingredient. I am not a big fan of pork roast, however. 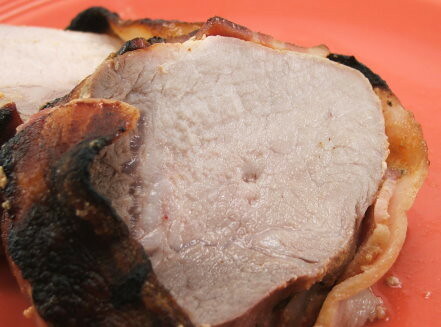 Most of the pork roast I have had has been dry, tough, and flavorless. Even with elaborate stuffing, injections, and coatings I have found most pork roast to be boring. 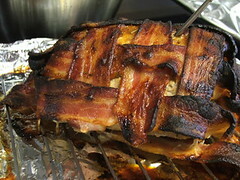 It is sad because most people I know love pork roast, including my husband. Ever the culinary adventurer, I decided to buy a pork roast in hopes of finding a way to keep it moist and give it a load of extra flavor so that even I would enjoy it. Enter my friend bacon. 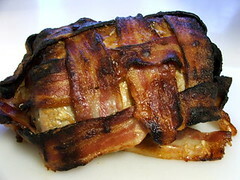 The salty and smoky flavor, combined with the tangy mustard rub, added a roundness of flavor to the pork, and the bacon wrap kept the meat very juicy. I was never a fan of pork roast before, but this recipe has changed my mind. Heat the oven to 375F and line a baking sheet with foil, then place a metal cooking rack on it that has been sprayed with non-stick spray. 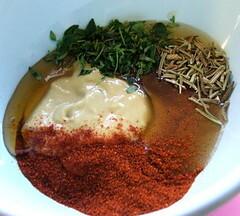 In a medium bowl combine the mustard, honey, rosemary, thyme, paprika, salt, and pepper. 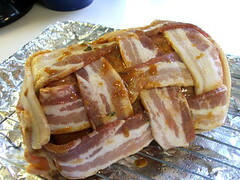 Coat the pork roast evenly with the mixture. Set aside while you prepare the bacon. 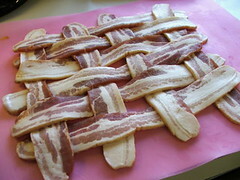 Weave the bacon into a lattice, similar to a pie crust, making sure not to not weave it too tightly. 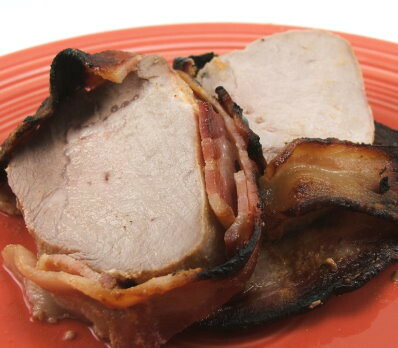 Set the coated pork roast at the top of the bacon and roll the roast, with the bacon, toward you. It helps to do this on a flexible cutting board or on parchment. Tuck the ends around the roast and secure with tooth picks. 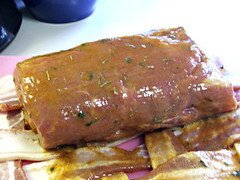 Place the wrapped roast on the prepared baking sheet. Bake until the roast reaches an internal temperature of 160F. Allow the roast to rest, tented in foil for 10 minutes before slicing.